Purchased as Lot 23 at the Magic Millions 2017 Perth Yearling Sale. LORDHELPMERUN (g. by Playing God). 2 wins. See below. Berry Delicious (Blevic). 5 wins to 1500m, A$422,345, ATC Dissident at Newgate Farm P., Heritage Society Anniversary H., Cellarbrations H., Alpha Flight Services H., Shop With the TAB App H., 2d ATC Thomson Reuters Tax H., Can Assist Charity Racing2win H., TAB Rewards H., Winx Hall of Fame H., First Australian Imperial Force H., Rexel H., TAB Early Quaddie 2YO H., 3d ATC Golden Pendant, Gr.2, Your Local Greengrocer H., Drummond Golf 2YO P., Cal Rei H.
Pure Heaven. 5 wins. See above. Botanist. Winner at 1200m in Aust. Willy White Socks. 10 wins from 1200m to 2000m, A$192,165, to 2018-19 in Aust. Grancabrio. 2 wins at 1200m in Aust. Nalani. Placed at 3 in Aust. Divine Ana. Placed at 2 & 3, 2d STC Lucky's Freeway Hotel H.
That's the Plan. 3 wins at 950m, 1000m to 2017-18 in Aust. Faster Logic. Winner at 1800m in 2016-17 in Aust. Knock on Wood. Winner at 2 in Aust. MAGIC HEAVEN (Magic Ring). 4 wins. See above. Top of the Top. 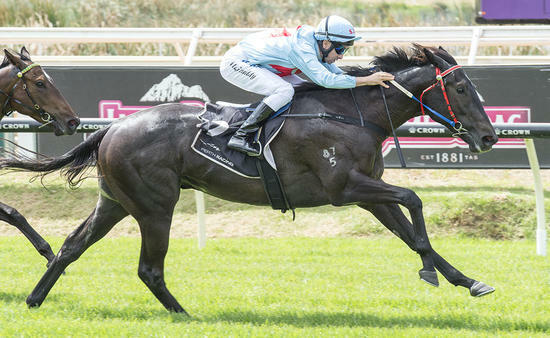 3 wins to 1550m, A$112,411, STC Schweppes Ciata H., De Bortoli Wines H., 2d AJC Bel Mondo Sprint H., STC Sydney Roosters H., WATC Barrosa Boy H., 3d AJC Marriott Hotels Australia H., STC John Cootes Furniture H., Theraces.com.au H., Escape to the Races H., NSW Tatt's RC Hat Studio H., MVRC Advanced Mailing Solutions H., WATC Real Magic H.
Darcy Vargas. 2 wins-1 at 2-at 1200m, 3d BTC Kobble Creek Racing H.
Purple Shalford. 4 wins from 1100m to 1800m in Malaysia. Apollo Star. 3 wins at 1200m, 1300m in Macau. Marc on the Line. 3 wins at 1200m, 1400m in Malaysia, 3d Singapore TC Class 3 H.
Divine Quest. 6 wins from 1400m to 1800m, R227,550, 2d Fairview Racing Express H.
Sophos. Winner at 1400m in Malaysia. POTENTIAL (Southern Appeal). 4 wins-2 at 2-to 1400m, A$81,550, WATC Ngawyni S., L, Lord Forrest Quality S., DJ Carmichael & Co H., WA Breeders' Champion 2YO Sprint S., 2d WATC Canberra Welter H., Parliamentary H., Princess H., Carbine Club Quality S., Prediction H., 3d WATC Perth S., L, Probus Welter H., 4th WATC Placid Ark Quality S., L. Producer. Talk to Angels (Don't Say Halo). Winner. See above. Lucky (Sound Reason). 3 wins at 1200m, 1600m, CJC St Albans H., 2d North Canterbury RC Inglewood S., L. Producer. Race Record: 5 Starts 2-2-1 A$276,800. 2 wins at 2, A$276,800, in 2017-18, WATC Sires' Produce S., Gr.3, Magic Millions 2YO P., 2d WATC Mouritz Blitz 2YO P., Happy 90th Leo Loughnan P., 3d WATC Karrakatta P., Gr.2.